Connecting from Windows to a Linux Server poses problems for the average person to connect, and use their Windows OS to connect to the Linux Server. For some this is enough to put off people from jumping in, or banging their head against the wall wondering why you cannot simply RDP into the server and where is the Admin Password for the Linux box. We are all used to what we are used to, and for many using a public/private key pair is part of the problem. We are not exposed to this in our daily lives, although with cloud computing via AWS you have to become smart in this process. The instructions at Amazon are not written in plain English and it's hard to find the details. Here are some handy steps that you can take to get access to your Amazon AWS server (Amazon Web Services) that takes place after you have set up your instance and downloaded your keys. You might want to read this article by Dave Winer to get through the set up of the AMI, downloading your keys and otherwise getting your first AWS instance set up and booted to the point where it is running. This is where this article steps in to help people connect to their Linux server from a Windows Box. For this process, we used the new Windows 7 as our Windows box, and all the software we recommend you download worked great. When you are building out your system you want to have your instance up and running. You can use any AMI (Amazon Machine Image) that you want to use; in this case we are using the simple LAMP Linux version. You can find the LAMP AMI by searching for “LAMP”. There are some quick GotCha’s that you want to know about before you put a lot of time into an AMI getting it all prepped for what you want to do. Windows or Linux does not matter, if you terminate the instance there is no way to restart it you will get the no valid actions error. When you terminate an instance you cannot restart it, it is gone, shutdown, lost forever. If you click on Launch, you will be prompted for a new image, regardless of what image you want to restart, so be very careful when you terminate an instance. If you terminate, it will be DOA for life. The image below shows what options you have using the AWS console provided by Amazon (via the Web). Remember, never click on Terminate unless you are completely done with the image and you never want to use it again. A running Linux instance does not have the “get administrative password” option that Dave talks about in his EC2 for Poets article. With Linux there are some things you have to do to get access. If you search Amazon you will see a ton of words on this subject that again for the average person is a rambling diatribe written by computer geeks for computer geeks. They even offer you a set of tools to download, but if you are running windows many of these tools will not work properly. Here are the tools you need to get started. Putty – Putty is an SSH terminal client that will tie in with another program that you will download here in a minute. Download PuTTY here. PuttyGen – You can download this software from the same place you downloaded putty. You will want this program to convert your Amazon Key from Amazon format to PPK format that the next bit of software you will download needs to make the connection to your new Linux server. WinSCP - WinSCP is a SFTP client and SSH client for Windows. Its main function is the secure file transfer between a local and a remote computer. It uses Secure Shell (SSH) and supports, in addition to Secure FTP, also legacy SCP protocol. You can download the software here. You should have your private key from Amazon when you first started up your AMI. Find the Private key you downloaded from Amazon, or make another key if you have to. Making a key is very easy, you can use Dave’s article, or follow the directions from Amazon which are less cogent but still follow able. Start the PuttyGen program as shown below. Find the key that you made when you made your initial image and click on load. You will get a dialog box that wants you to load your key file that you got from Amazon. Find where you dropped your key file (again probably in downloads). Remember to set your file type to * to see all your files (otherwise it will default to looking for a PPK file, which you do not have yet). Click on OK when you find and enter your file name. You should see the dialog below that shows the Amazon key was successfully converted from the Amazon format to the PPK format that WinSCP needs to work properly. Click on Save Private Key. You really need to save your private key at this point. Remember where you saved your brand new PPK extension key (if you forget where you saved it, search your computer for *.ppk). You have made it through the first hurdle, and now you need to fire up WinSCP. If you skipped everything else and ended up here, WinSCP is a SFTP client and SSH client for Windows. Its main function is the secure file transfer between a local and a remote computer. It uses Secure Shell (SSH) and supports, in addition to Secure FTP, also legacy SCP protocol. You can download it from Source Forge. You only have to enter minimal data here, your host name is your EC2 instance, your user name is Root, leave the password BLANK, and click on the three dots for your private key file. 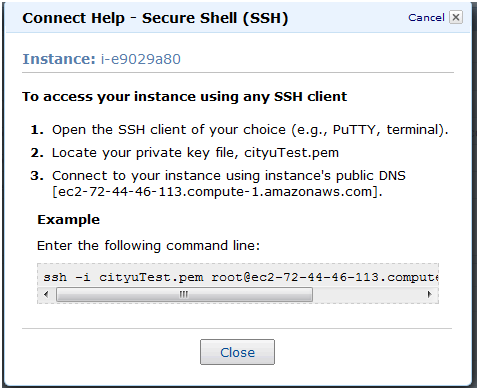 If you do not know what your AWS instance is, you can go back to the AWS console and click on connect, you will get a connect help Secure Shell (SSH) help screen. This screen might look bad, but it has all the information you need for the Amazon instance you want to connect to. The screen below shows you what the help screen looks like. This is your host name that you want to put into your WinSCP line for host name. The image below show the WinSCP entry screen with all the data filled out. You want your WinSCP Login screen to look exactly like this, short of the instance name and the PPK key; yours will be different in terms of what is in the Host Name entry, and where you stored your own Private Key file. Remember that your Private Key file is the key you converted in PuttyGen. Click on Login and you will connect to your Amazon EC2 instance. The good part is now you can tool around the Linux AMI using a graphical interface, and drag and drop files from your computer to the Amazon AMI that you are using. In WinSCP on the top command ribbon bar you should see two icons as circled below. To get to the Command Line in Linux (remember this is why you downloaded Putty) you want to click on the two PC’s on the top command ribbon shown below. This will launch the Putty command shell that will allow you to tool around the Amazon AMI. You need to be familiar with the Linux command line because you can do things here that you cannot do in the graphical interface, like bring up the update programs, tool around the OS to get an idea of where things are, use ps –ef |grep PROGRAM to see what programs are running (great for debugging MySQL), and to launch specific MySQL commands. This is what you should see when you click on the two computers graphic in the screen above. Here are some discovered issues with the AMI that I built out. MySQL has no password, it is root followed quickly by a blank password. You need to use the MySQL command line to set a password for this as soon as you can. The MySQL website can help you out setting the password. The AMI in this instance when you look at the security group in the Amazon Web Services Console automatically opened up port 3306 for world wide access to your MySQL database. You want to take this rule out of the configuration, especially if you do not set a password. This is one excellent and easy way for hackers to get into your MySQL database; you need to fix this before you have the world hit your web site. If you are interested in just web services you will find the root for HTTP under the home directory. If you are interested in making sure that your Linux AMI is up to date, you need to use YUM, type in YUM update to update your whole computer or type in YUM update php if you want to make sure you are working with the latest version of PHP. Here is the catch, the YUM repo’s that come with the AMI we were using could not find any updates, and started throwing errors that it could not find any available mirrors. The problem with this is that you cannot update your software, which from a security viewpoint is very bad. If YUM is not finding updates, there are many resources on the internet to help you through this, the problem is that the repo’s that come with the image we were using goes right back to the Fedora repository, which is distressingly empty of updates for known vulnerable software. There are options on where you can go to get updates, but that will be another topic to talk about, updating your shiny new Amazon AMI for security when support is lacking from the people who make the software you are using. If your program has dependencies on the version of PHP you are using (in my case the version was 5.0.4, and needed 5.1.X) you will have to hack your installation script if it checks the environmental variables for your PHP server. That means stepping through the entire install, and finding the call where it tests the PHP environment and changing that part of the install script. You can edit the file in WinSCP and save it back to the server, just remember what files you had to change (hack) when you get done.